The connection of the series isolation transformers to the power cables requires primary connector kits that can be applied to cable ends in a few minutes by the electrical installer following simple illustrated instructions. 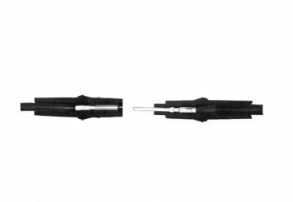 PCK primary kits are designed for 5 kV unshielded (not screened) cables. Metal plug and receptacle fittings are crimped onto the conductors and then inserted into the moulded rubber housings. Upon pushing the assemblies together, the circuit is ready for immediate use. Primary kits provide both a plug and a receptacle. One kit is required for each transformer location for the ends of the series cable sections. The circuits may be readily disconnected for testing or for replacing faulty equipment and then quickly rejoined for continued use.